I haven’t been much inclined to blog because I caught a nasty cold. For my Nurturing Thursday post, though, I want to mention that my husband has been very considerate and nurturing while I’ve been sick. Yesterday he bought groceries and cooked dinner, both of which are usually my chores. 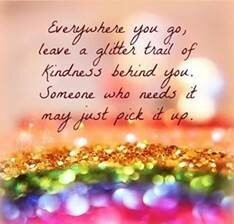 So I’d say that he deserves recognition for brightening up my blah week with a bit of kindness glitter! Hope you are feeling better with each day! This is a WOW post. Hope you are better now. Thanks much, Indira… still not fully recovered, but feeling better each day. This is a wonderful reminder. Take care Meg. Hope you are drinking lot of water or herbal tea. Take care.